El Anatsui, from the Eclipse Suite, 2016. Intaglio print with collage and chine collé, 99 X 99 cm. Photo by Oak Taylor-Smith. Courtesy of October Gallery. El Anatsui, Benchmarks, created in collaboration with Factum Arte, an extraordinary studio based in Madrid renowned for its synergy of past, present and future techniques. Though globally-renowned for his iconic hangings of aluminium bottle-tops, Anatsui’s artistic practice has always been rooted in the discovery of new media. 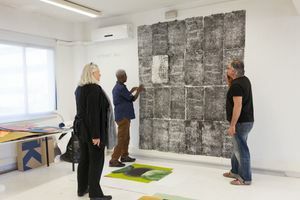 Having graduated from Kwame Nkrumah University of Science and Technology in Kumasi, Ghana, the artist set about ‘forgetting everything (he) had been taught’ in the search for new modes of expression, and the materials needed to convey them. Following the imperative that an artist should work ‘with whatever his environment throws up’, Anatsui created a wide variety of novel sculptural forms with materials that range from tropical hardwoods to cassava graters, driftwood, obituary printing plates and aluminium bottle-tops. His interest is in the physical history of the materials themselves, the stories they contain and the journeys that bring them into his hands. It was just such a remarkable journey that first led the artist to work with bottle-tops when he happened upon several bags of them lying discarded by a local liquor shop and found inscribed within a hidden history of trade in West Africa. At the age of 73, and after a fifty-year career, crowned with the Golden Lion for Lifetime Achievement at the 56th Venice Biennale, Anatsui has found a new source of inspiration in the residual marks and traces of his own art practice and has poured all his energies into exploring these newfound possibilities. Anatsui’s metal wall sculptures are worked on by a team of assistants who crush, fold and pierce the bottle-tops on tables and on smaller flats of wood. The repetitive and relentless force exerted on these surfaces over many years has resulted in a landscape of textured relief embedded in the worktops. These wooden surfaces were delivered to the studios of Factum Arte together with some bottle-top off-cuts and cassava graters that had been used in earlier works, to serve as the primary source materials for this new series of prints. The tabletops and wooden boards were 3-D scanned at a very high resolution, routed onto aluminium plates and then printed through an etching press. Black ink was used to access the textural information held both in the intaglio and on the surface; others were worked upon in colour, while others still with chine collé laminates. The artist played with endless combinations and permutations of the resulting prints to create these syntheses. An overlapping pair of prints from one circular tray prompted the artist to imagine a lunar eclipse, resulting in the first completed set of thirteen pieces, named the Eclipse Suite, after the thirteen cycles of the moon. Elsewhere, the bottle-top off-cuts and cassava graters were inked up and printed raw, both on their own and in conjunction with the printed tabletops. 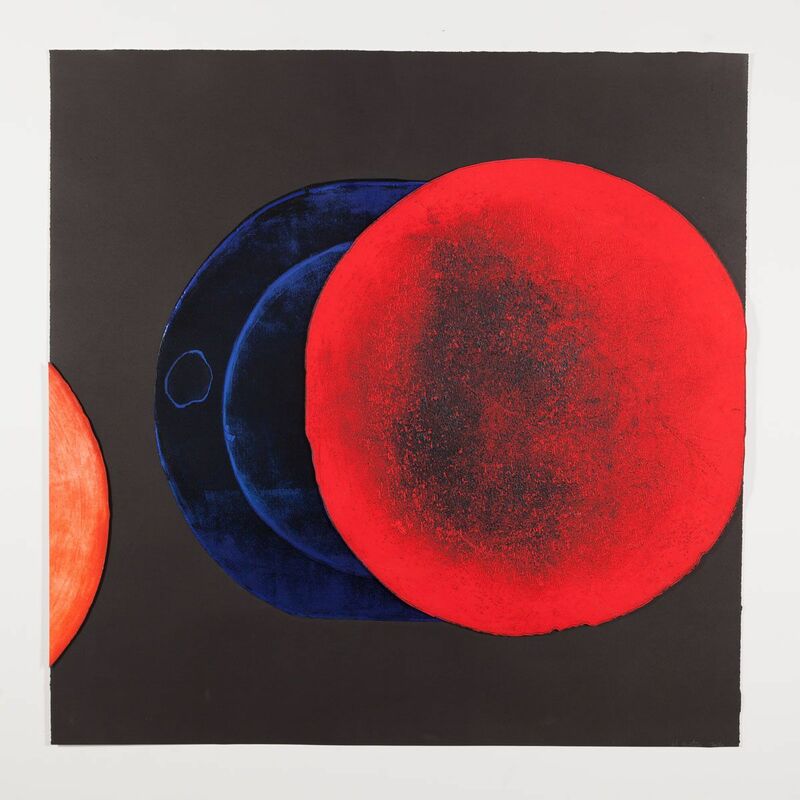 For one particularly direct work, coloured ink was laboriously dabbed onto dampened Japanese paper overlaying a large and highly textured tabletop, producing a detailed relief print that bears witness to many years of accumulated mark-making. Today, El Anatsui continues to experiment with his newfound mode of creation. This preview exhibition will present a selection of works from the Benchmarks print project and indicate just some of the many new directions being explored in this ever-expanding oeuvre.